I do love picnics. A visit to somewhere beautiful with friends or family, the chance to prepare some yummy dishes to fill the basket and having a good old chinwag while we tuck in. Just fabulous. Now on to the reality. Scotland. It rains a lot! I do mean a lot. This Summer has been particularly bad, but I do have to be fair, in between all the rain, we have had some glorious days. So, I am waiting for one of those days for my next picnic. Here are a few of the dishes I might make for my picnic. Now all I need is a picnic basket. I have always wanted one, but never got around to buying one. Last year I bought an lidded egg basket, with the intention of using it for picnics, but autumn came around and I started using it to store Cooper's bibs in. 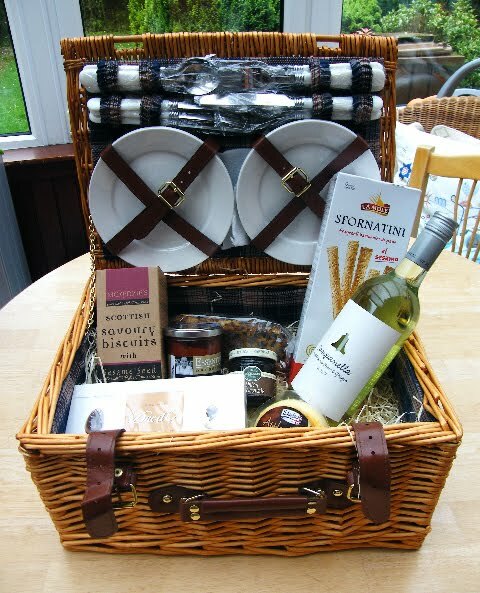 So, I was absolutely delighted when Interflora got in touch offering me a picnic basket hamper to review. You might be surprised to hear that Interflora do anything other than Flower Gifts. I had a vague idea that they did other gifts. I remember someone posting about the cutest iced shoe cookies. 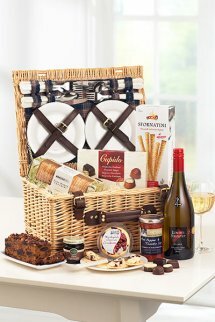 They actually do a wide range of hampers, some filled with wine, some are full to the brim with sweets, some have cookies or cupcakes or fruit or chocolate..... the list goes on. There were a few changes to my basket. I got some smoked applewood cheese instead of Wensleydale, but I love smoked applewood, so I was pleased with that change and the chocolates I recieved were Duc d'O Belgian chocolates, again not complaining. I have to admit, I have already tucked in. The wine if gone and we have tucked into the smoked applewood and chocolates. My dad went home with the fruit cake, so it is gradually emptying. That is fine though, as I will fill it up with my own goodies for my next picnic. The exciting news, is that Interflora are giving me another basket (the same one) as a giveaway prize. Tune in next week for the giveaway. Why not load this free picnic app from Countrylife onto your mobile? It contains interesting picnic locations, recipes and games for the kids, for when they start to get bored. 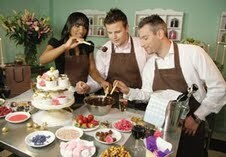 I am hugely excited to be hosting this month’s Forever Nigella for my dear friend Sarah at Maison Cupcake. Started in January of this year it has become a hugely popular event attracting entries from all over the world. This month the theme is picnic pleasures, suitable dishes would be ones that can be packed up, travel well, can be eaten with fingers, or just a fork. Little Owl would like to remind you that there are a few things going on at Tinned Tomatoes this month. 1. Win a place on a Green & Black's Workshop. This exciting competition is open to UK residents or those travelling to the UK this year and runs until Sunday 14 August 2011. 2. Give some of those bookmarked recipes, that you keep collecting, an airing and join in with the monthly challenge Bookmarked Recipes. You can post your bookmarked recipes and add them to the linky until Saturday 27 August 2011. The guidelines can be found here. 3. 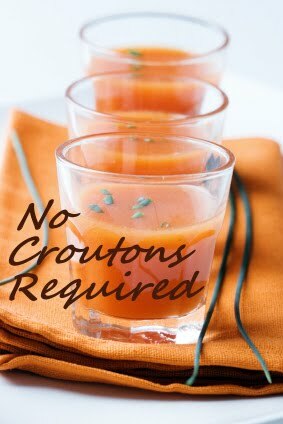 Cook up a soup or salad including lentils for this month's No Croutons Required. You have up until the 20th of August to submit your dishes. Remember they must be suitable for vegetarians. Visit The Food Blog Diary for all the latest foodie competitions, giveaways and events. The diary is updated regularly as the month goes on. Lovely basket Jac! It will be perfect for forwever Nigella this month with the picnic theme! Oh you lucky duck!!! 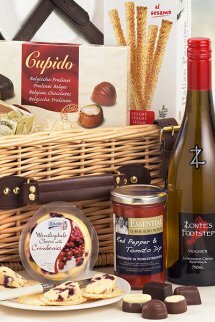 What a lovely hamper, I also didn't know Interflora did anything other than flowers! Just think of all the goodies you can pack into this!! I know Chele, it's great, isn't it? You will have to enter the giveaway next week, if you don't have a basket. You have moved already or have you just booked it? very exciting. WHat a lovely picnic basket, I didn't know Interflora did them. Oh my goodness!!! I love picnic baskets! They make me smile and remember good times! Darn, I live in Canada. You have no idea how I would love to receive a picnic basket. But then again I am happy that there is plenty of opportunity for more than just those living in the States:D So much going on here at TT this month! Goodness it's a giveaway every week! Mr Farmer was very pleased with his Hotel Chocolat summer handbag lol! He doesn't care what they call it, it's the choccies that count ;p Hoping to do the picnic challenge although it may be alfresco eating rather than picnic. Also thinking about lentils. We shall see. I would love to live where you are Val, all the foodie things and the scenery, well it is just beautiful, oh and did I mention the weather? We've managed to get one picnic in glorious weather this year. The classic wicker basket is so romantic, if not the most practical! 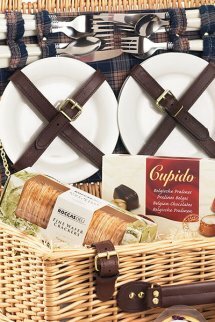 I have always fantasised about a picnic blanket with the plates strapped in like that! I need a citroen 2CV to go with it! I haven't seen picnic baskets in years...they have vastly improved since then. I can't believe all the stuff that can be fit into that one. I LOVE picnics and have a stash of favourite recipes for picnics, whether they be inside or outside! I know Johanna, I struggle to join many events these days. What a lovely picnic basket that is! It rains a lot where I live too, but on the rare gorgeous sunny day a picnic is really perfect! It is Faith, although it is hard to think of what a sunny day is like, looking out on the torrential rain we have here today. This post definitely makes me want to head out for a long, delicious picnic right now. If only London in August was a bit warmer!